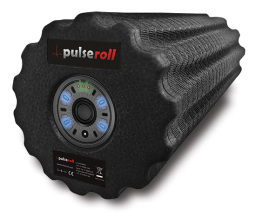 Introducing Pulseroll This revolutionary vibrating foam roller is the new best friend of fitness enthusiasts the world over. With a striking design outside and advanced technology inside, this must-have accessory delivers high-penetration muscle relief. The vibrating foam roller can be used during your warm up for softening the muscle tissue, cooling down after a workout and to massage various parts of the body. Using the unique combination of pressure and vibration it will help loosen your muscles, increase blood flow and flush away lactic acid. The Vibrating Foam Roller is a super-versatile piece of exercise equipment that offers many benefits similar to a sports massage. It can be used in the gym, home or rehabilitation clinic to improve a person's flexibility, balance and core muscle strength. Through continued use you will notice an increase range of motion and flexibility and will increase your circulation.